Julie Mialet expertises your jewelry and stones in Paris by appointment in her shop near the Ecole Militaire. A qualified Gemologist, Julie Mialet will carry out the expertise of your jewelry in the best conditions and with discretion. 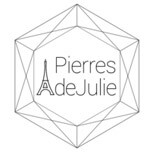 In the heart of Paris, in the district of the Ecole Militaire, Pierres de Julie specializes in gemstones and precious stones: we can estimate your jewelry in the best conditions and with discretion. Contact us at + 33 1 43 06 36 30 or email contact@lespierresdejulie.com to arrange an appointment for your jewelry expertise in Paris. This first telephone contact will allow you to inquire about the quality of your jewelry or your stones to estimate. The oral expertise of a fine and precious stone or jewelry is graceful. We will not charge you fees or payment. The written expertise, and therefore which engages our responsibility, starts from 200,00 € TTC according to the number of jewels or stones as well as the complexity of the searches. Purchase gold by weight, at the best price. Advice offered. Why not trade your gold (18 carats in all forms) for a new item in the window of your choice? A beautiful way to buy jewelry!